New Delhi: On January 31, thousand of protesters including teachers, students and activists went out on the streets of the National Capital to protest against the Bill/ Ordinance to restore the 200-point reservation roster on the basis of college/university as a unit instead of taking the department as a unit. The protest took political outlook as political heavyweights joined the mega protest, Delhi Deputy Chief Minister Manish Sisodia, MLA Jignesh Mevani, Bhim Army Chief Chandrashekhar Azad Raavan, former union minister Upendra Kushwaha, Umar Khalid and several political parties including Aam Aadmi Party, Samajwadi Party and the hosts Rashtriya Lok Samta Party surfaced their aggression in the protest. The protest was began from Mandi House and concluded at Jantar Mantar under heavy security arrangements. 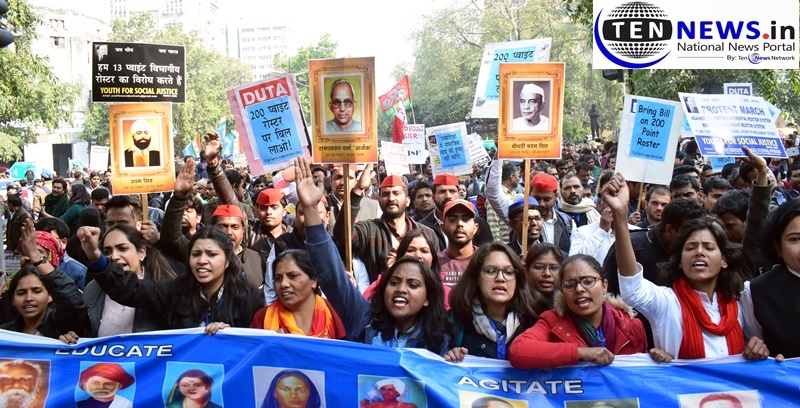 Various organisations including Delhi University Teachers Association (DUTA) and Students’s Federation of India (SFI) actively participated in the massive rally. While former minister opposing the 200-point roster said,”this government ending the reservation of Scheduled Caste and Scheduled Tribes,now the time has came, the government should discuss the issue in this session of Parliament. The protesters in their loud voices used these slogans to express their issues, “Awaaz do, hum sab ek hain” on the roads of National Capital. VP Venkaiah Naidu Unveils Grand Wall Mural of Mahatma Gandhi in New Delhi!